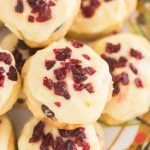 Buttery, melt-in-your-mouth sugar cookies, soft and puffy, madeover for Christmas with an eggnog theme! 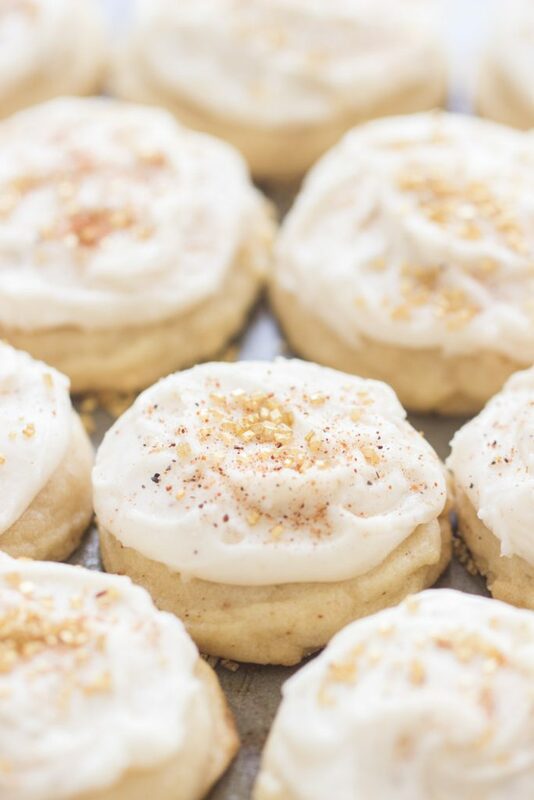 These Eggnog Amish Sugar Cookies are potent with eggnog vibes with the help of nutmeg and rum extract. 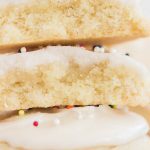 Topped with a thick layer of eggnog-flavored icing, these Eggnog Amish Sugar Cookies are a holiday must. It used to really annoy me, and still occasionally does, when I find an eggnog recipe that doesn’t contain eggnog. It happens pretty frequently! If I want a recipe that is eggnog-themed, I feel it should contain actual eggnog. 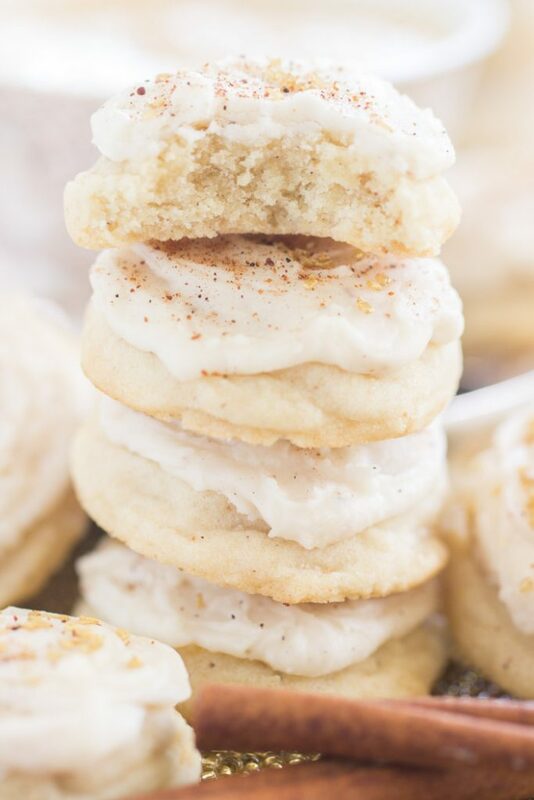 These Eggnog Amish Sugar Cookies don’t. I’m committing one of the things that annoys me most in a recipe. 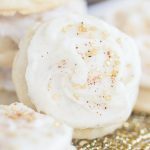 But when it comes to cookies, at least, I’m now on board that the best way to achieve eggnog flavor is with rum extract (or real rum) and nutmeg. 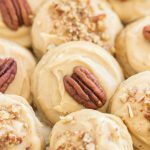 I’m going against my principles, and I’m sharing a recipe for Eggnog Amish Sugar Cookies that doesn’t contain eggnog. 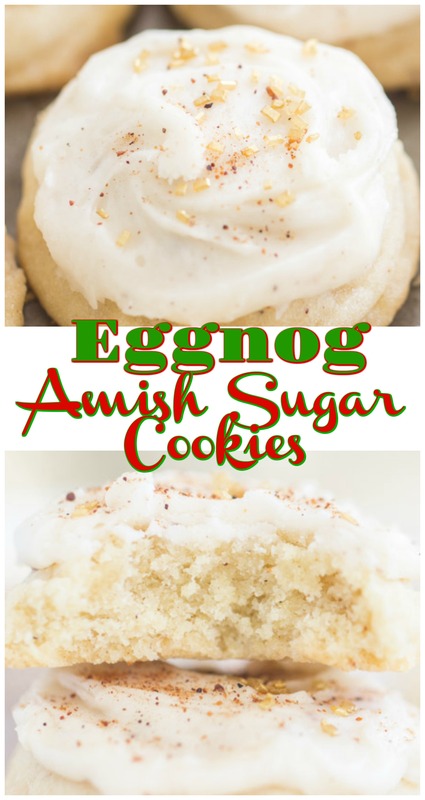 I hate me a little, but I guarantee that these will still give you alllll the eggnog feels, and then some. These Eggnog Amish Sugar Cookies are potent with ‘eggnog’ vibes. Try one bite, and you will 100% think: this is an eggnog recipe. Turns out, rum and nutmeg get the job done, and no eggnog needed. 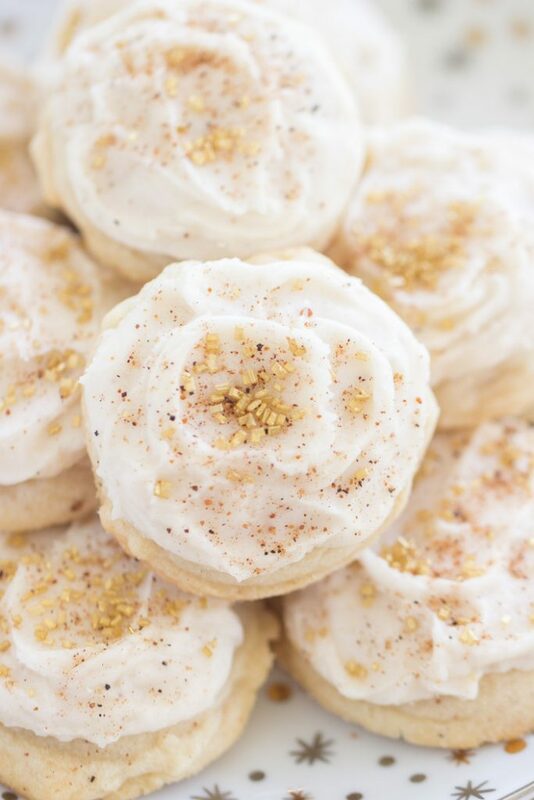 At least as it pertains to these Eggnog Amish Sugar Cookies. 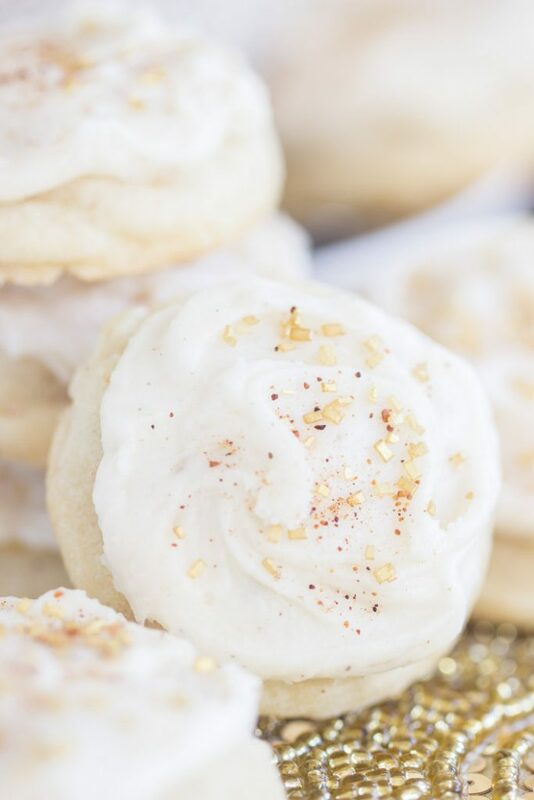 See, cookies don’t usually call for much liquid, so there’s no great way to incorporate eggnog in a cookie recipe… not enough to actually get the taste of eggnog to come through anyway. 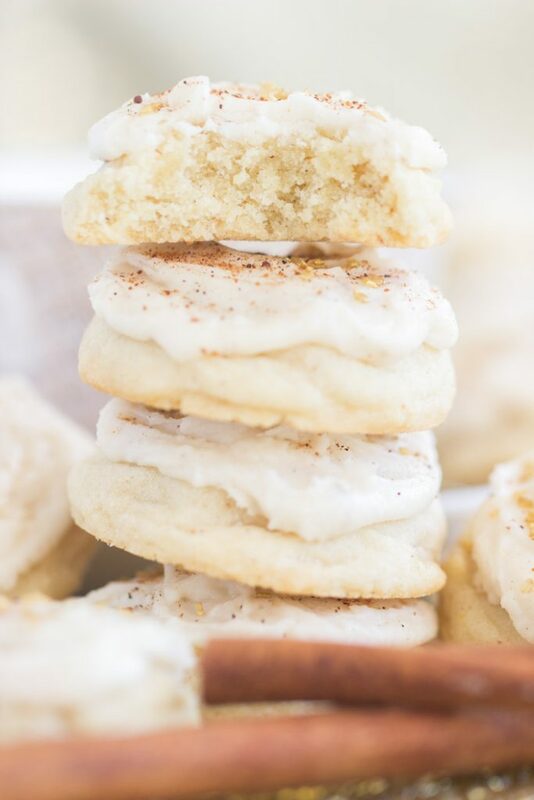 These Eggnog Amish Sugar Cookies might be the best ‘eggnog’ recipe I’ve tried in a while, and very impressive that they don’t contain any. 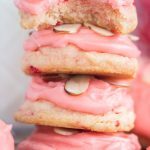 They are Christmas in a cookie, and I’m super excited to make these again for the holidays. I actually made them sometime in September, so it’s going to be fun to churn them out again closer to Christmas. 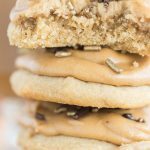 Amish Sugar Cookies are very buttery, soft and puffy, and they truly have a ‘melt-in-your-mouth’ quality. They’re foolproof and easy, and they’re universally loved. 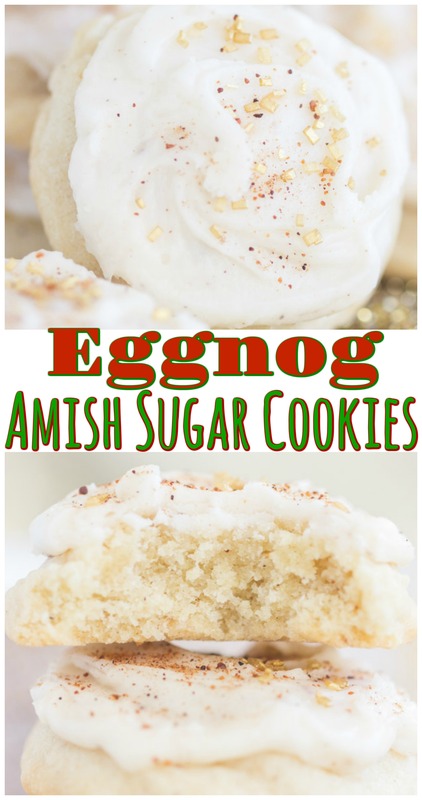 I have a few more Christmas versions upcoming, besides these Eggnog Amish Sugar Cookies. Also, I’ve made a lot of variations in the past, so here’s all the other ones I have so far! Tis’ the season! Beat in eggs, vanilla, and rum extract. In a large bowl, whisk together flour, baking soda, cream of tartar, and nutmeg. Whisk together butter, vanilla, rum extract, 1/4 cup milk, and nutmeg, until smooth. 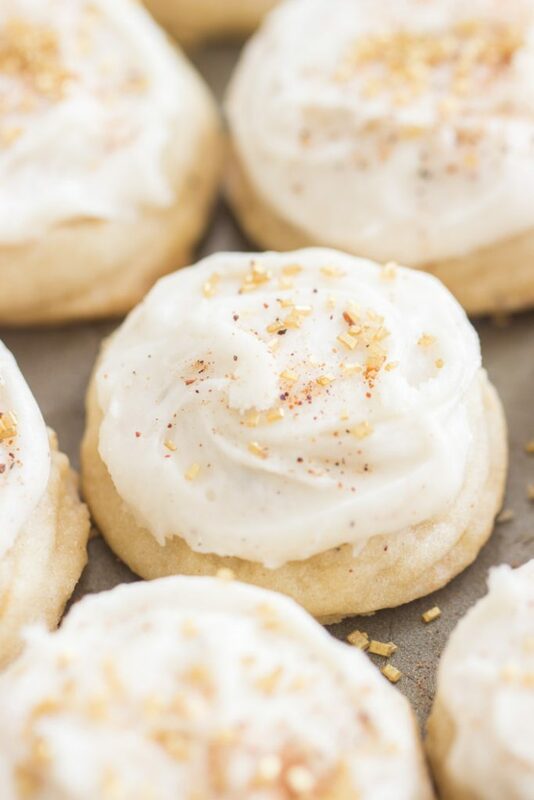 Frost cookies, dust with additional nutmeg, if desired, and allow to set. Rum extract can be substituted with a few tablespoons of dark rum. I've made these Amish Sugar Cookies into Cherry Almond Amish Sugar Cookies, Pecan Praline Amish Sugar Cookies, Iced Maple Amish Sugar Cookies, Pumpkin Spice Latte Amish Sugar Cookies, Iced Chai-Spiced Amish Sugar Cookies, Iced Vanilla Amish Sugar Cookies, Iced Almond Cookies, Iced Lemon Amish Sugar Cookies, Iced Orange Amish Sugar Cookies, Toasted Coconut Amish Sugar Cookies, Coconut Oil Amish Sugar Cookies, and Thin Crispy Amish Sugar Cookies!